Estonia is one of the three small countries immediately west of Russia known as the Baltic States, being (as they are) on the Baltic Sea. It broke away from the Soviet Union in 1991, and in 2004 it joined the EU; six weeks later, we visited. Estonians account for the majority of the population, but there is still a significant proportion of Russians who are slowly trickling back home. We visited Estonia as part of our Baltic '04 tour, and stayed for two nights in the capital, Tallinn, at the Hostel Vana Tom just off the main square. We had timed our visit perfectly to coincide with the summer solstice festival where everyone leaves the cities and goes to have parties in the country, so the city was somewhat empty and a lot of things were closed. Raekoja Plats is the town hall square of the old city of Tallinn, with the medieval town house there on the right. The place is surrounded by expensive (by Estonian standards) restaurants, and we went to a place just off the square where I had a cheese board followed by a steak, and two pints of beer for about 200 kroons or eight quid. Viru is the main street of the old town, which like the rest of the old town has been nicely restored and repainted. 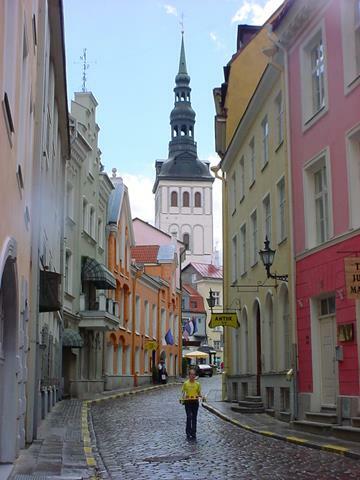 I really liked the old town of Tallinn, the scenery was very nice and picturesque, and there were hardly any cars. You can see the spire of Tallinn Town Hall in the background. There were lots of medieval-esque vendors wandering around on the streets, selling nuts, crafts and in this case strawberries. There were also	the world's most enthusiastic postcard sellers, a popular summer job for students, they wouldn't let me leave until I bought plenty of cards and Ken bought a calender. 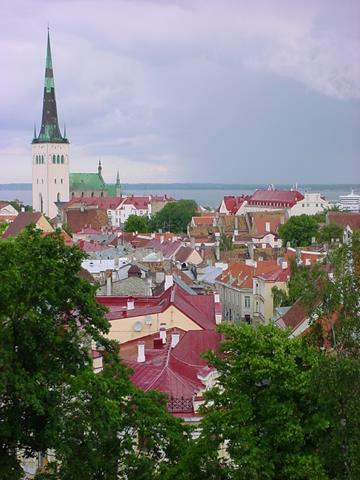 A view from Toompea of the red rooftops of the old town from the high point in the city. 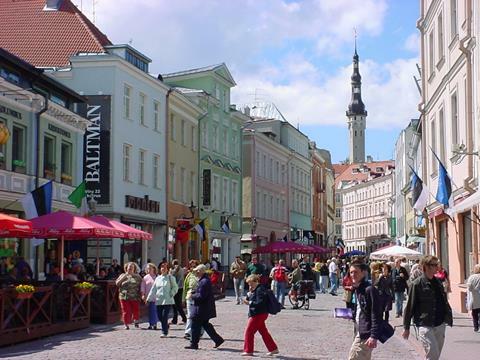 The old town of Tallinn is a Unesco World Heritage Site. 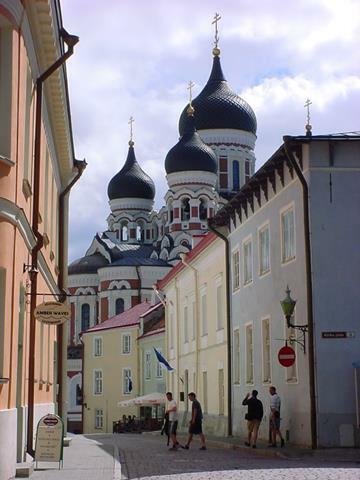 Alexander Nevsky Cathedral was built in 1900 to look much older than it actually is, as part of the "Russification" of Estonia. Since the Soviets left in 1991 the Estonians have been a bit unsure of what to do with it, as it is Russian Orthodox which is not Estonian, but at the same time it is a very nice building. It stands at the top of Toompea hill. 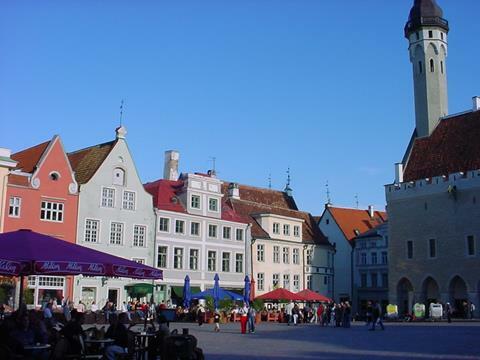 Tallinn's old town was very peaceful and a great place to relax, the whole place was laid back and just cool. 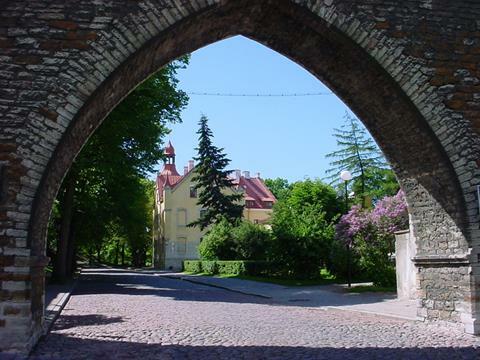 This is a view through one of the arches in the medieval town wall. The new town outside is much more modernised, with western hotels and the like, but for a city of 400,000 people the centre is very quiet and it doesn't feel like a big industrial city by any standard.